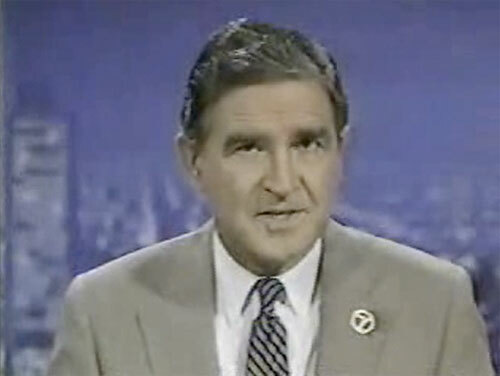 Video frame of John Drury anchor/reporter with WLS Channel 7 in 1987. John Drury, 80, died Sunday, Nov. 25, surrounded by family in his home in Wheaton after a nearly three-year struggle with amyotrophic lateral sclerosis, or Lou Gehrig’s disease. John Drury, a former resident of Arlington Heights, is most famous for his work as WBBM co-anchor with Fahey Flynn in the 1960’s, his work as anchor for WGN Channel 9, and WLS Channel 7. He considered himself a reporter first and an anchor second. John Drury video in a WLS news teaser about the Chicago Bears and the NFL strike in 1987. In four decades of reporting, John Drury won several awards with a classy and credible approach to local news reporting, including Emmy Awards for Individual Excellence in 1983, 1987 and 1988 and, most recently, an Emmy in 2003 for his special report “9/11/02 The New Homeland.” In 1996 he was named to the Chicago Journalism Hall of Fame and awarded the prestigious Silver Circle Award or 25 years of outstanding contributions to Chicago television. A handsome John Drury balanced serious news reporting with a great sense of humor and a great voice. Video of John Drury as WLS news anchor on the night of September 11, 2001. WLS EYEWITNESS NEWS with John Drury opening for the 10 p.m. news in 1987. John Drury was born in Aurora, Illinois and graduated from West Aurora High School in 1945. Immediately after high school, John Drury served in World War II with the Navy. A report released by the Defense Technical Information Center in January 2006 showed that ALS mortality risk among world War II veterans showed an increased incidence of Amyotrophic Lateral Sclerosis (ALS) in men who served in the military in World War II, Korea and Vietnam. The study included 500,000 men with 513 ALS deaths. The mortality risk was similar for Army, National Guard, Navy and Air Force; however, the risk was slightly higher for the Navy personnel. Abstract : The authors prospectively assessed the association between Amyotrophic Lateral Sclerosis (ALS) mortality and self-reported military service in the American Cancer Society’s Cancer Prevention Study II (CPS II) cohort, a cohort that includes over 500,000 men who were surveyed by questionnaire in 1982. ALS mortality was assessed via linkage with the National Death Index. Their original analyses included ALS deaths (n = 280) up to 1998. They have now extended the follow-up to 2002 (ALS deaths = 513). Mantel-Haenszel relative risks (RR) adjusted for age and smoking were calculated and Cox proportional hazards models stratified on single year of age were used when adjusting for additional variables. Men who served in the military (69% of their population) had a significantly increased ALS mortality (RR = 1.5) compared to those who did not serve. The increase in ALS mortality was similar among men who served in the Army or National Guard (RR = 1.5), Navy (RR = 1.7), or Air Force (RR = 1.5). This increased risk of ALS appeared largely independent of branch of service, years of service, number of major conflicts during service, and war periods during service (i.e., World War II, the Korean War, and the Vietnam War). The project will continue as planned. The authors will extend the follow-up and examine the possible role of vitamin E supplements in prevention.